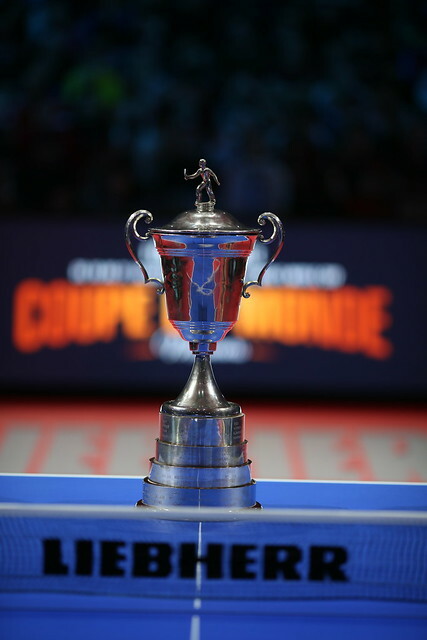 Defeat earlier in the day for Emmanuel Lebesson at the hands of Timo Boll, as play concluded in the opening round of the Liebherr 2018 ITTF Men’s World Cup in Paris on the afternoon of Saturday 20th Octiober, French hopes ended. Simon Gauzy, the no.10 seed, was beaten by Korea Republic’s Lee Sangsu, the no.5 seed, in seven games (6-11, 11-4, 11-6, 7-11, 6-11, 11-8, 11-8), the reverse coming after Vladimir Samsonov, the no.15 seed, had upset the order of merit to beat Hong Kong’s Wong Chun Ting, the no.7 seed (11-6, 12-10, 11-9, 7-11, 11-7) and thus emerged the only player who had been required to compete in the group phase to reserve a quarter-final place. Generations apart and styles apart, it was the control of Vladimir Samsonov that eventually prevailed against the dynamic pen-holder, Wong Chun Ting, a player whoever he opposes covers ever centimetre of the playing area. Furthermore, it meant the result of just under one year ago in the opening round of the Men’s Singles event at the Seamaster 2017 ITTF World Tour Grand Finals, was reversed. On that occasion, Wong Chun Ting had prevailed in seven games. No doubt more acclimatized to the venue, Vladimir Samsonov having competed in the group stage of proceedings, made the better start but it was the second and third games that proved crucial. It was at that stage a wise head combined with the now legendary ability to exercise control over a table tennis ball proved vital. In both games Wang Chun Ting had the opportunity to build on a slender lead; in both games Vladimir Samsonov never gave his younger adversary the opportunity; in the crucial stages control counted. Wong Chun Ting recovered somewhat to secure the fourth but any possible fightback to set the scene alight was soon thwarted. A hard fought win for Vladimir Samsonov, it was even harder for Lee Sangsu, a full distance contest was the scenario. In the decisive seventh game, at the change of ends Simon Gauzy led 5-2, he lost the next five points, before eventually saving one match point when defeat loomed. He saved no more. At the quarter-final stage Vladimir Samsonov meets Fan Zhendong, Koki Niwa opposes Lin Gaoyuan; in the opposite half of the draw it is Dimitrij Ovtcharov versus Lee Sangsu, Tomokazu Harimoto in opposition to Timo Boll.